The ODUNDE Festival, held in South Philadelphia each year on the second Sunday in June, celebrates the history and heritage of African people around the globe and serves to instill and encourage cultural pride. Taking its name from the word meaning “Happy New Year” in the Yoruba language (placed in all capital letters by the festival founders for emphasis), the event celebrates the coming of another year for Africans in America and throughout the diaspora. From its origins in 1975, the festival became one of the largest and longest-running African American street festivals in the United States. 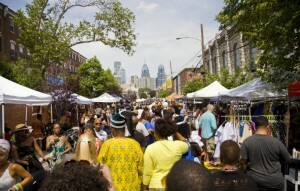 While the black community embraced the festival, increasing gentrification in South Philadelphia led to opposition by some new occupants of the neighborhood. In 1984 a group of residents collected signatures and petitioned City Hall to remove the festival, stating that it had grown too large for the neighborhood. The city offered Fernandez a subsidy to move the event to Penn’s Landing, but because of the racial undertones of the complaints and the tradition of using the South Street Bridge to present offerings to Oshun, she refused. Over the years other residents and neighborhood groups also tried suing to stop the event, but with the support of the black community, Fernandez succeeded in keeping the festival in its original South Street location and responded to the opposition by expanding. The festival evolved to include a variety of pre-festival events, including networking opportunities, cultural and historical panels, zumba classes, library and museum exhibits, an African business roundtable, an African diplomatic ambassador reception. The festival officially begins with a procession from Twenty-Third and South Streets to the Schuylkill River to honor the Yoruba orisha (deity) Oshun, the goddess of the river, who is associated with love, beauty, femininity and fertility. Participants usually wear white clothing or traditional African attire and make their pilgrimage to pour libations, offer prayers and incantations, and give offerings of honey, fruit, flowers, or money while accompanied by drumming and dancing. The procession then makes its way back from the river to the festival area, a vibrant re-creation of an African marketplace. 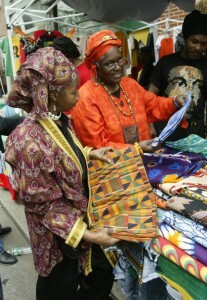 In the streets packed with participants, vendors from all over the African diaspora sell African and Caribbean food, crafts, clothing, art, and jewelry. 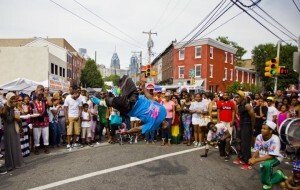 Performances on two main stages—one on South Street and one on Grays Ferry Avenue—feature entertainment ranging from rap and hip hop to fashion shows to tap dancing to African drumming and traditional dances. Impromptu street performances occur on nearby street corners. 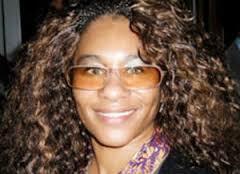 In 2011, Oshunbumi Fernandez (b. 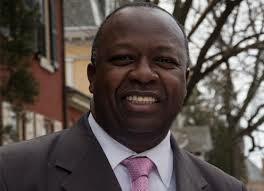 1974) created ODUNDE 365 to build a cultural movement beyond the festival. This organization promotes the principles of the festival year-round through African drumming and dancing classes for children, African arts courses, a self-esteem program for young girls called “I AM BUMI” (Beautiful, Unique, Magnificent, Individual), and a program called “My Story,” which promotes success through local, influential professionals sharing their stories with young people. In 2013 the organization collaborated with Philadelphia music legend Kenneth Gamble (b. 1943) to create Kwanzaabration, an event to educate children and adults about Kwanzaa and the holiday’s seven principles. Although it started from humble beginnings, ODUNDE evolved into a prominent community staple and celebration of the cultural heritage of African people around the globe. Seeking to instill and encourage cultural pride throughout the year, the festival has demonstrated the impact that committed individuals may have on their local, national, and international communities. Christina Afia Harris is a Ph.D. candidate in the Department of Africology and Africana Studies at Temple University. This essay is derived from her research and her experience as an ODUNDE participant.